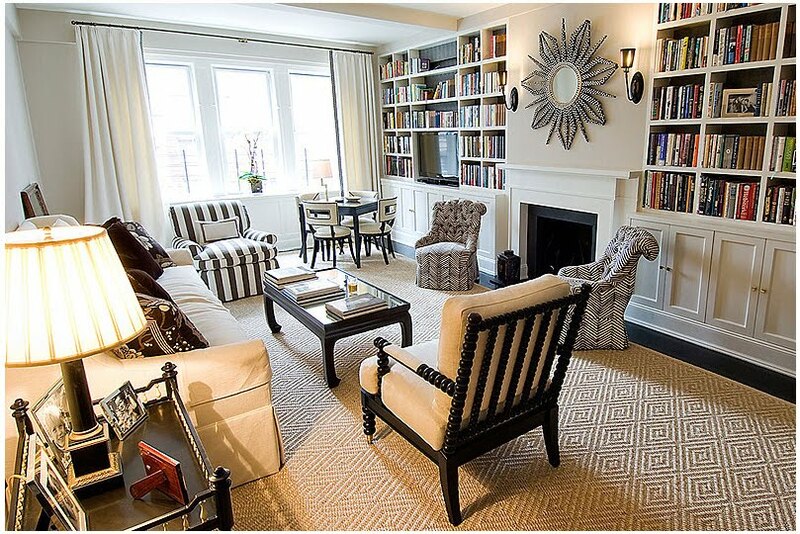 Lets start with this living room. I die. Like, I die over and over again. Everything in this room is beyond perfect. 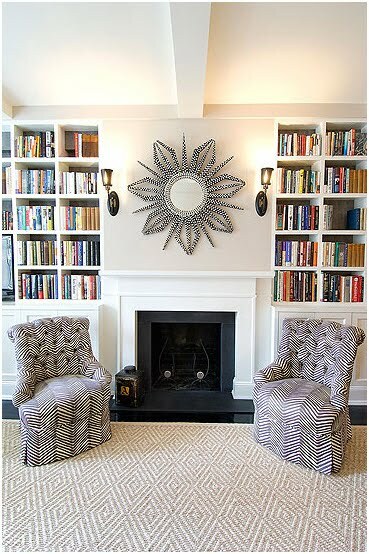 I love the texture of the rug, paired with the spool chair, the pair of beautifully tufted side chairs, the striped arm chair, just about everything. I'm normally a total color freak, but this room made me love neutrals all over again. OK, it doesnt get better then that! This room is perfectly formal, yet somehow informal enough that it could be used everyday. While I don't think slipper chairs are particularly comfortable, these look extra wide and squishy- easy to curl up on. I also love the look of them here since there are no arms to block the view of the other end of the room, making the room look larger. Ok, Charlie- I love your room! Its not too kiddy looking, has the right amount of grown up and I'm sure that Charlie is the cool kid in school. Lets be serious for a second, a baby has no clue if they sleep in a cool room or not, right? But if the kid who sleeps here just knew the fabulous room he/she got to sleep in every night they would be the coolest baby in play group- or whatever groups babies go to these days. Please direct your attention to the nailhead detail on the headboard, the patterned rug & the zebra storage boxes under the crib- all perfectly placed details- I love me some pretty details! 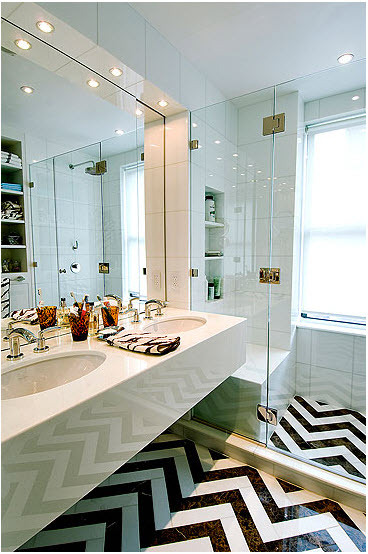 Chevron for the bathroom floor...serious hotness! 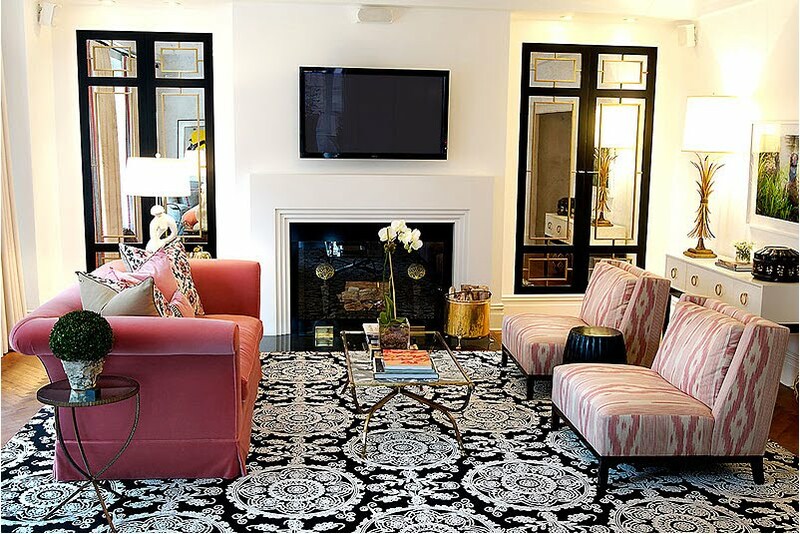 Hot rug, hot sofa, hot pillows, hot chairs, hot built-ins, hot shades... hot everything! Lacquered blue walls- OMG, I would die for these in my apartment. If I could go back in time this is how I would want my first post-college apartment to look like. You know, young, living in the big city with my best girlfriends- we would have the prettiest place where everyone would want to be. orangefrigginceilingsareyoukiddingme!! I would literally buy an air mattress and sleep in here JUST so I could wake up to that pretty orange beauty every.single.morning. OK nothing can top that, so the picture montage is over. But, seriously Christina if you are out there- I love your work and if I ever move to NY you are the first person I am calling to see if you need an assistant. OK she can be your girlfriend because you called her first and she is amazing. I will just love her from afar. I could live in any of those kids rooms they are perfect!! Oh MY. I am in love as well...wow. Great inspiration! I totally concur. The crush is completely legit. I want that pink couch!! adding that to my "i need it, i want it" file!! Amazing! Her flooring choices blow me away! The second nursery, wow. And I am really contemplating a single bed in my nursery for #2. And the "first post college appt.....wow. All lovely images...can see where your crush is coming from. i will keel over and die right there with you! that bathroom floor is out of control. i LOVE! have a great weekend my love. GORGEOUS!! I Love how every room is so distinct and yet they still flow together so well. Lovely!! Simply beautiful - you are justified in your designer crush! Gorgeous, gorgeous! I especially love the kids' rooms. So cheerful! That mirror is sooooooo gorgeous! I have to agree with you! Those spaces are amazing! Excuse me while I pick my jaw up off the floor. Gorgeous, gorgeous rooms indeed. I'm obsessed with the third children's room you posted. My only complaint is the mirror in the second photo is giving me the heebie jeebies-reminds me of big hairy spider legs! agree agree agree, fabulous! Im crushing with you, everything is stunning, love the floors!! i concur. big fat wad on my screen. my friday has been made. so funny! I almost blogged about her today too! Wow, her work is incredible. 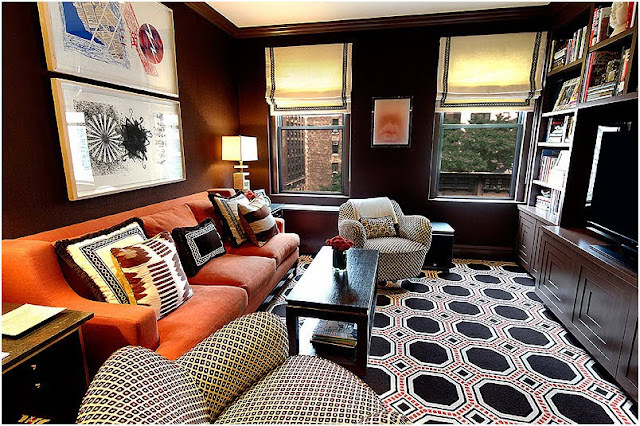 I especially like the bold carpets she uses in many of the rooms. 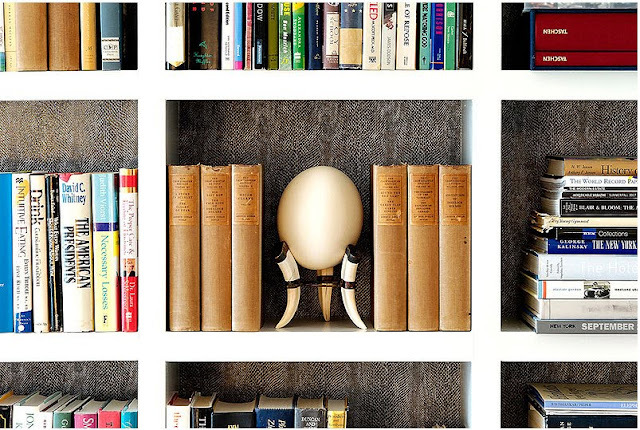 I had seen some of her rooms before but really enjoyed this little tour of her portfolio. WOW! It's pretty hard to impress me and I AM BLOWN AWAY! I now want to re-do my whole house in black cream and orange...well actually it already kindof is but WOW! Send her a creative resume.., what do you have to lose!? You can stay here when you come down for your interview or at least come out for a sunset sail! Gorgeous! I've now saved a few of those in my home inspiration folder. 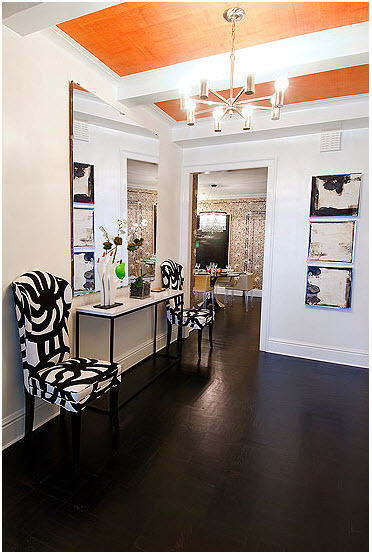 The orange ceiling is AH-MAZING! I am in love - wow. what fabulousness....I can see your wedding now, white dress, orange flowers, and the men in navy suits...and graphic ties....with an orange rose pinned to their lapels. Orange socks....? love that mirror over the mantle, I'm trying to figure out a DIY version of something similar with one of those convex anti theft mirrors. The apartment is perfect, I love the pillows. Her choice in floor coverings is what really gets me. Perfect in each and every one of those images! where to start? it's incredible! and yes, that ceiling is amazing! so crush-worthy! so much to love, especially that nursery with the twin bed and the orange ceiling. beautiful rooms!! love-love love!!!! so much energy and these spaces are just so prefectly happy & GORGEOUS!!!! Wow! I'm crushing too! Thanks for sharing. Some truly inspirational pics. OMG! Seriously!? I am dying right there with you!!! Orange ceilings and all...and I do mean ALL! I live in New York...may have to actually stalk! Thanks for the intro! WOW how about that zig zag floor in the bathroom! OOOH! The bedroom with the yellow headboard is my favorite but I love it all! 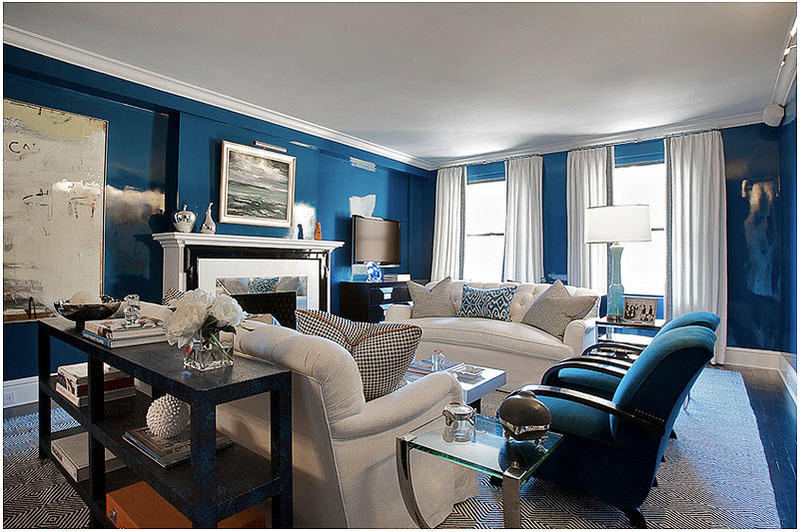 Love CM - if I had the cash, I'd totally hire them to makeover my apt. Gorgeous! Meg- you just made my day!! I'm so jealous you get to work with such a great designer- her work is just stunning!! Great designs! I LOVE the yellow striped nursery- so adorable!! !